I have a confession to make. I never tasted a sweet potato until well into my adult life. I’m sure we had them on the Thanksgiving table, served in a casserole dish, cooked in something way too sweet, and covered in mini marshmallows, but I couldn’t get past the idea of a potato and marshmallow in the same bite, so I never ate them. Those cans of candied yams at the grocery store didn’t help my opinion of them much either. One day I tried them in a restaurant, and I realized they don’t need brown sugar or mini marshmallows, because they’re AMAZINGLY DELICIOUS all on their own. Fast forward too many years to count, and sweet potatoes are now a staple in my house. We love them baked, roasted, grilled, or mashed, and they always brighten up even the most boring of dinner plates. In addition to the fact that they are delicious, sweet potatoes are a nutrition bang for the calorie buck. People are always afraid that they’re high in sugar and calories, but one medium sweet potato only has about 100 calories, plus more than a day’s worth of vitamin A, from beta carotene, and 4 grams of fiber. Even though they are sweeter than regular potatoes, they have a lower glycemic index, which means they raise your blood sugar more slowly than most other starches, including white potatoes. That’s good! 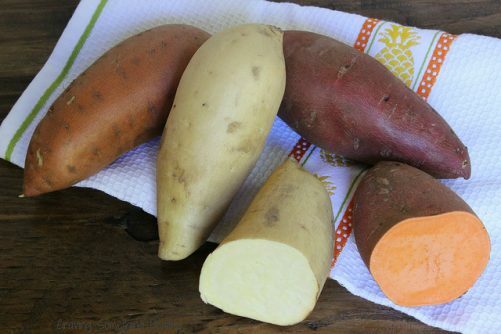 Another interesting bit of trivia about sweet potatoes – they are available in several varieties. They range from tan skin with white flesh (but still sweet and creamy in texture) to red skinned with a deep orange flesh. How fun to play with the range of colors and subtle taste differences! For this recipe I decided to get really creative with sweet potatoes. 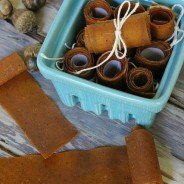 I’ve been wanting to experiment with fruit leather for a while, so why not Sweet Potato Pie flavored fruit leather? I’m happy to say it is super easy to make, and much healthier than the big brands at the grocery store. Don’t be afraid of the extremely long bake time, it’s completely hands off, and as a bonus your house will smell heavenly! While you can use parchment paper to line your baking sheet, a Silpat silicone baking mat is preferred. I tried it both ways and the parchment paper wrinkled as the fruit leather dried, so it wouldn’t come off in one sheet. An offset spatula makes the spreading much easier, but you can also use a flat rubber spatula. Line a cookie sheet with a silpat silicone baking mat. Peel and cut fruit and sweetpotato into 1-inch pieces. You should have approximately 4 cups total. Put fruit and sweetpotato into a microwaveable bowl, and microwave on high approximately 8 minutes or until everything is soft and tender. Transfer contents to the bowl of a food processor. Add agave syrup and spice, and puree mixture until completely smooth. Pour mixture onto the silpat and smooth out to the edges until evenly thin and smooth. Bake on a middle oven rack for 4-5 hours, until fruit leather is firm to the touch, and pulls away from the silpat easily. Let cool, and cut into 6 long strips. Store rolled up in an airtight bag or container. 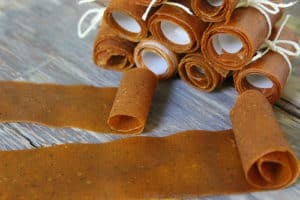 Have you ever made fruit leather? What’s your favorite way to eat sweetpotatoes? Oh yum! A few month’s ago I made Dixya’s Avocado Mango Fruit Leather from the California Avocado recipe challenge – look forward to trying out your version! You made my day. 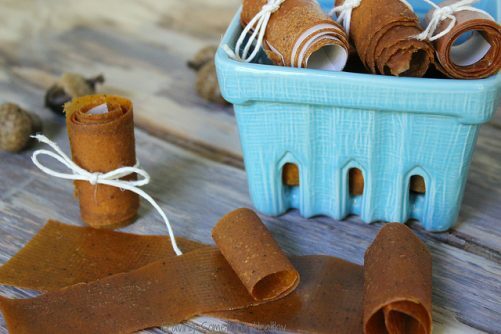 I didn’t know that you could make fruit leather without adding a lot of sugar. I am looking forward to making these roll-ups. Good luck with the contest! I made Tex-Mex Stuffed Sweetpotatoes. See you in the winners circle. I love to make fruit leather…but this is super combo I’ve never thought of. Yummy! What a great combo of fall flavors for fruit leather. I want to make this for my kiddos!